3 bedrooms, 2 baths, living room, dining area, kitchen, Jekyll room, patio, shared sun deck and separate laundry room (shared). MW, DW, W/D (shared), 2 Cable TVs, DVD, Wifi DSL, ASK ABOUT PETS, NO SMOKING. BEDS: 2 Queens, 3 Single. Accommodates 7. We loved this house. Very clean, very comfortable and very convenient. Loved being so close to the beach. Overall, we had a great experience on Jekyll. The location of the house was ideal in terms of access to the beach. Overall, we were very comfortable in the house, although it does seem like it could use a little TLC. Minor things, such as closet doors and kitchen drawers that are a bit worn, and don't work quite right. Also, there was a crack in one of the windows in the sunroom that should really be replaced, as well as a missing glass panel between the sunroom and living room. But, again, all and all, we found the house very comfortable. We had one problem with the clothes dryer not working, but the folks at Jekyll Realty were very prompt in sending someone out to repair it. 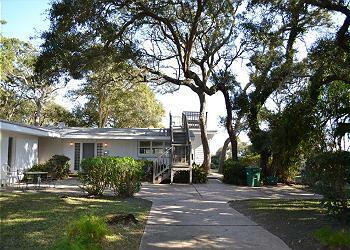 The location is great, near the beach and access. Jekyll and it's bike trails is a perfect vacation spot. WE have recommended it to many of our friends. Right on the beach and close to everything! Jekyll Realty was helpful and responsive to every question. Highly recommend them. Cute cottage but neglected. I cleaned the entire place as soon as we arrived with Lysol, mopped the bathroom floors,cleaned most of the the baseboards since they were so dirty. Wiped down all the kitchen cabinets and fridge handle. Bathroom floors need a good scrubbing with bleach. We didn't want to take our flops off in there. The tablecloth had sticky jelly and syrup on it. We found out all the mattress pads and bed spreads are not cleaned unless the previous guests cleaned them before they checked out by 10am. They have a rule that you change them if they are soiled. If not, make the bed. Yikes!!! I didn't want to do a bunch of laundry when we just got to the beach! !I didn't want to clean a house when I finally just arrived at the beach!!! I definitely left that place way cleaner for the next guest. need to throw old things away instead of hiding them in closets. Our dogs enjoyed another wonderful vacation at Cottage By The Sea. Their 2x/day adventures on the beach were fun to watch. Oh, we parents enjoyed our private time on the beach during the remainder of the day. Only complaint is the kitchen could be better equipped for cooking. ie: no spatulas, wooden spoons, sharp cutlery (only steak knives), or mugs for coffee (only tea cups). The stove top functionality is questionable. It was a nice house great location but for the price could use some upgrades. I think for the price, linens should be provided. We loved the location on the island. We also enjoyed very much, the deer visiting daily. They were so friendly. We loved the restaurant, Driftwood Bistro in the area.